This personalised hanging slate heart makes a fantastic personalised wedding gift or a unique gift for someone you love. It is made of natural slate and is approximately 15cm tall. Included in the cost of the slate hanging heart is engraving of up to 50 characters to personalise the heart. The personalised message is left as natural slate and will be centred on the heart. There is an additional charge for extra letters, a logo or a satin lined box. The postage rate for the personalised hanging slate heart with rope is band A. 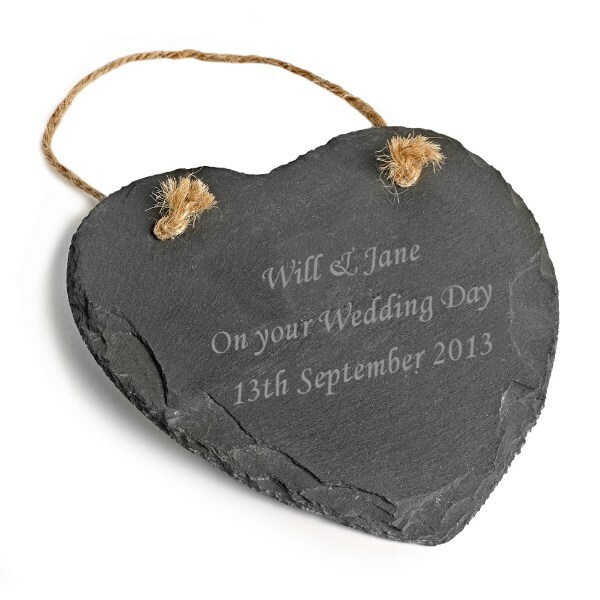 Note as slate is a natural product, the shape, size and colour of the personalised hanging slate heart may vary slightly from the image here.